Exporter of a wide range of products which include industrial shafts and industrial drive shafts. With huge approval by our clients, we are engaged in presenting a wide assortment of Industrial Shafts. The offered industrial shaft is processed with the help best grade metal which is procured from the consistent vendors. This industrial shaft is provided in diverse stipulation according to the details laid down by our customers. Our patrons can have this industrial shaft at nominal rates. 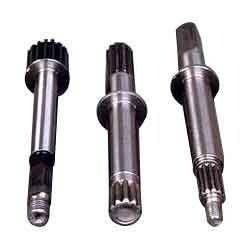 Our organization has created niche in providing Industrial Drive Shafts to our clients. Industrial Drive Shafts are widely used in industrial applications and are noted for their precise dimensions, excellent texture and unmatched quality. Industrial Drive Shafts are packaged in best grade material for sale to our patrons and are available in various dimensions and other similar options to cater to the ever-growing market requirements. We are providing the complete assortment at reasonable rates to our clients with view to fulfill their demands.